Today has been… a day. We met with the transplant team this morning, and Scott and I’s heads are both overwhelmed with information. We have given the go ahead to do the transplant evaluation on Annabelle, which involves a lot of tests including a CT scan of her head, blood tests, a urine test, and a psych evaluation on Scott and I. I told them up front that we were crazy already… so at least they are forwarned! I’m learning a ton of things I never knew before. 99% of it makes a lot of sense! First, what we were told yesterday about having to have a retransplant every 10-15 years is not necessarily true. We are now told that they “hope” the new heart will last a life time. The problem is, and this is where the discrepancy in opinions comes in, that no one really knows how long the heart will last. They first started doing heart transplants in babies in 1982. This was the year after I was born! It is frightening to know that if I’d have been born with what Annabelle has, they would have shook their heads, and sent me home to die. Anyway, heart transplant’s in babies really picked up as a viable option closer to the late 80’s and into the 90’s, so most of the babies who had transplants are just now teenagers and in their early twenties. The data about how long a heart lasts is taken from these kids. And most of these kids have had to have a retransplant. But they were the first ones. Medicine has changed since then. There are new and better medicines. Risks are less (although still great.) So no one can really know for all certainty how long a new heart will last for Annabelle. The first thing I did not realize is how very selective they are in the heart transplant process. The baby must be in reasonably good health except for the heart. There must be a good chance for the baby to be able to grow up and be a fully functioning, productive member of society, and that there are no other health concerns that might hinder the child from living long-term. As cruel as this might sound to refuse some children a spot on the “list”, it does, unfortunately, make sense. There are a lot of babies who need new hearts. Unfortunately (but thankfully…) there are not that many donor hearts available. They choose those who they put on the list very carefully to ensure they have the best chances of surviving with a new heart and using it to its fullest. The CT scan, for example, is done to make sure there isn’t any damage to the brain that isn’t otherwise seen in her so far, that would not allow her to be fully functioning on the long term. There is no way to know this for sure, but a CT scan can rule out many things. Her need to be healthy enough for a transplant is one of the reasons they are prompting us to list Annabelle now. If she gets so sick that they are unsure if she would survive a heart transplant, that would make her ineligible for a heart. And if we go through another surgery and she does not do well, she could either 1.) get too sick or 2.) have a much shorter period of time she could survive without a new heart, meaning she might die before one is available. How long does it take to get a heart? The answer is, obviously, it depends. They say on average 6 to 8 weeks, but it could be a few days after getting on the list, or it could be 6 months. Can Annabelle go home and wait for a heart? This is a hard thing for Scott and I. If we pushed to be able to bring Annabelle home, this would 1.) make her vitually ineligible for a heart, because it puts her at the end of the list as she is well enough to BE home and 2.) be very risky because if something happened at home with her breathing or heart, this could turn into a life-threatening emergency much faster there than it would if we were already in the hospital. The other note is that her heart isn’t functioning the greatest right now, although she is stable, but there is a medicine they can put her on that will help the function. However, we must go back down to the ICU in order to get it, as it is only given through her IV and requires a lot of monitoring. But being in the ICU also puts us higher on the list as well, so we aren’t sure that that is a bad thing. Although it is SO much nicer to be upstairs! In the end though, we want what is best for Annabelle, and will defer to them. Who decides who gets a heart? A computer. And thank goodness for that! Could you imagine having to be the one who sifts through files of sick kids and decides who gets to live and who might not? How horrible! No, they have a computer that has criteria programmed into it. There are 4 different “levels” on the transplant list. 1a is most critical (in the ICU), 1b is next critical (In the hospital but not in ICU), 2 is not critical (home) and 7 is inactive (holds your spot but you don’t need one right now.) This is REALLY an over generalization and there are a lot more criteria that determines the level, but it is a summary anyway. Then it goes by how long you’ve been on the transplant list. Where does the heart come from? Physically, it comes from a child who has a compatible blood type and is comparable in size (the same size to 2x the weight of the receiving child.) As far as location, the US is set up in regions, so the heart would be from somewhere in our region. Sorry if this was a little long and detailed, but to be honest, it helped to type some of the info out just to solidify what was in my head! I think one of the hardest things for me to accept, and the thing I’ve tried to think about the least in this process, is that another child has to die in order for mine to live. It feels cruel, but I also remind myself this: As a mother, if something ever happened to one of my children, I would donate their organs in a heartbeat, and I would never want the receiving mother to feel guilty. Also, that baby isn’t dying BECAUSE my baby needs a heart. That baby went to be with Jesus regardless. My child will just have a longer life because of the thoughtfulness and loving heart of grieving parents. That doesn’t make it easier. But makes me okay about accepting this new reality. Scott and I went on a “date” today. We went out to dinner, saw a movie, got Scott’s hair cut, and went to Target. Our shopping trip was a slightly sad one though. In a way, we are in mourning. We are mourning the loss of our baby coming home right now. Everywhere we went, there were reminders. I remembered the warm fuzzy snowsuit I’d bought her that is at home, and she probably won’t need. We have her infant carseat that she very well might be too big to be in by the time we leave. I have her “first church” dress hanging in my closet at home that she probably won’t fit into by the time I get to take her to church. Over the last month, I finally let myself buy her a good bit of clothes in preparation for her coming home, and many of them are impractical for the hospital while she is hooked up to so much stuff, and will be too small (and too hot) once she does come home. There are so many things… but as we were leaving Target, Scott and I were talking about it, and decided that we should be pretty thankful. How much worse would it be to be walking through the store, seeing all the baby items, and not having our baby with us at all. While we mourn this stage we are losing at “home” with our baby, we celebrate her life that she is still living, and the hope of a much better life with a brand spanking new heart. The things we mourn are just that: Things. Life, every blessed day we are gifted, is much more important. You may be assuming by now that we have made a decision to go ahead with the transplant. That is kinda correct. We are leaning toward that and shifting our mindset. However we have sent all her medical records to 3 different doctors at three of the top hospitals for Children’s cardiac care for second opinions. We are deferring a final decision until we have reviewed their recommendations. But for now, we are going through the motions “just in case” so if we DO decide to move forward, we are ready and don’t have to wait on more paperwork. As far as Annabelle today, overall she had a great day. NO FEVER!!! We are SO very pleased about that! She did have some issues with desatting and fussiness this afternoon, but we think her stomach may not like her new formula they put her on a few weeks ago, because when we stopped feeds… she got better! We’ll be discussing with doctor’s tomorrow. Please know that we covet and appreciate each one of your prayers. They’ve meant SO much to Scott and I during this time. I'm glad you and Scott were able to get some time together today away from the hospital so you could process all the information you've had to take in, shift gears, and reach some decisions. I realize things are still uncertain until the test results and second opinions come back, but at least you have a plan of action. Hopefully, that helps some. She's so blessed to have such a strong and loving mommy! I don't comment very often, but keep up on your blog regularly and pray for your family often. I just wanted to let you know that I'm sending up extra prayers for you and Scott during this time of incredibly difficult decisions. Krista, So glad you had some time with your husband yesterday. I'm sure your head is swimming more than usual…which means it must be drowning by now. The transplant process for infants sounds similar to what my sister has gone through. It's such a narrow window of the "perfect storm" to get them on that list. Praying for your sanity in the meantime, my friend. Praying for you and your family! She is blessed to have you as a support system! dePraying for you and your family! She is blessed to have you as a support system! I have been following your blog and praying for you and the rest of your family especially baby Annabelle. I know that what you are going through is very scary and very hard, I know because we have experienced transplant. My baby Elijah had his heart transplant when he was 8 months old, he is now 2 years old. He is walking, eating and playing, he is almost like a typical child its just that he takes medicine and we are extra careful with him. I will continue to lift your family in prayers, if you have any questions, please don't hesitate to contact me. How wonderful you and Scott were able to go on a date. You two so deserved some "time off". Thank you for writing everything down so we can learn too. It puts things in perspective and gives us extra subjects to pray for. I'm glad you see clearly that receiving a heart from another child is not something to feel guilty about. If or when it happens, will they tell you who that baby was? Of course continued prayers for your family and for the decisions you have to make! I can see how God is giving you strength, wisdom, and clarity with Annabelle. I just want to say that I admire your courage (A LOT!). I pray that you and Scott are blessed and strengthened and that our Father in Heaven gives you the wisdom to make all these difficult decisions. I pray that your other girls are doing well too! I just found your blog through google alerts I do for infant heart transplants. My daughter had a heart transplant at 4 MO (she will be two next month). If you have any questions or would just like to chat with someone who has been there, please feel free to email me. Your daughter is beautiful…I will keep you all in my thoughts and prayers. I haven't read your blog for a few days, so when I saw "heart transplant" I thought wow. I am praying for little Annabelle and the decisions you and your husband are about to make. Glad you got to go out on a date. Hope that you got a bit of rest this weekend, too. Praying and thinking of you all. You continue to be on my prayer list. I'm a retired RN and my first thought was wow as well. Oh, Krista, thank you for sharing. Praise GOD for medical options! May God direct every appointment, every procedure, and give you the peace that passeth understanding. I have not been on blog in a while. Always lifting Annabelle in Prayer, Today she was so strong on my heart so my friendws and i lifted her in prayer, It went hevenly father. We ask you to give Annabelle a new hevenly heart the one you created her a healthy working heart. Annabelles heart we speak healing to you you need to line up with the word of God wich is healing, Father we ask you to bless and hold Annabeles family and let them know you are their with them and you Love there family very much. Father we ask for the healing miracale we call it forth in Jesus name that it will be for your Glory. You said this is your year of miracales. And we at Victory in Tucson stand in the gap and ask your covering over Annabelle and her family. psalm 91 the enemys planes be destroyed. Amen. We love your heart for the Lord. This was strong on my heart too. We pray prtection and rest and widom over the doctors and nurses as well. I also say no matter wht is said. You know Jesus he said. Anable is healed and we are standing on that promise and we love you so please don't take offence. I pray you recieve ths.. Incredible information on heart transplants. Thank you so much for sharing. The Lord is obviously strong in your hearts, you and Scott appear so calm and collected. Just what little Annabelle needs. You and your family are on my prayer list. I'll keep watching your blog for further updates. I know how unique every baby that comes into this world is, so this is my mindset when i say, hang in there. Keep being strong for her. She is so precious and beautiful…Before my daughter had her heart transplant, I went through much of what you are describing. I have never experienced anything as excruciating as waiting 8 months with another one in diapers at home and a 5 year old too! When I look at her now, 2 years and 3 months old–I am so inspired by her incredible will to live, that I don't have time to be depressed about that period in our lives…It makes me think that I am so fortunate to have an awareness to this reality and how it helps me to put things in perspective to truly treasure life!–Sound familiar? 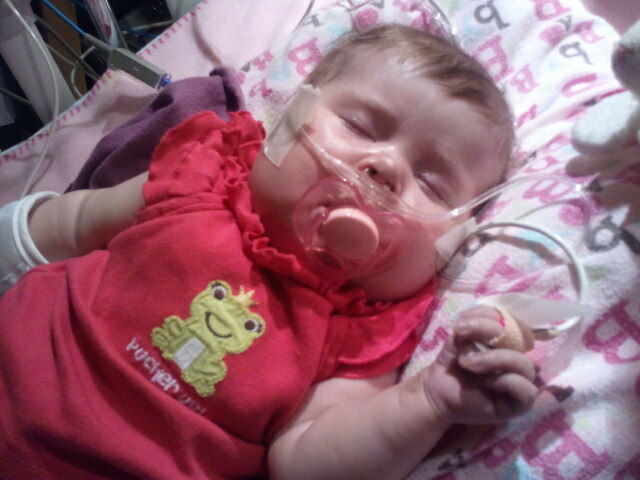 Everyday I now pray for mom's who have baby's that are waiting for transplants or who have babies that are sick at all. I NEVER prayed for them before this experience…God bless you and keep you and i hope he will continue to send angels to help you through this difficult time!